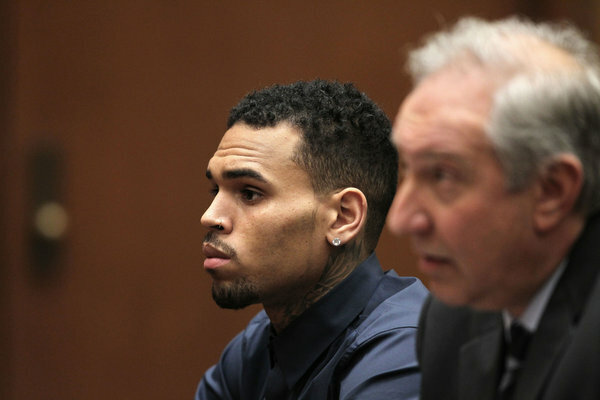 Chris Brown avoided being sent to jail Monday after a judge cited the singer’s progress in court-ordered therapy, although a probation report in his assault case noted that he had suffered a “setback mentally and emotionally” when he was not fully credited for his community service hours. Convicted in 2009 for assaulting then-girlfriend Rihanna, the “Love More” singer was ordered into a 90-day live-in anger-management treatment program, in which he would have to complete three eight-hour days of community service each week and undergo periodic drug tests. The Grammy Award winner has been diagnosed with attention deficit disorder, according to his probation report, and suffered a “setback mentally and emotionally” when he was “not credited for all the hours” he served in community service. He also became depressed during that time, the probation report said. Los Angeles County Deputy Dist. Atty. Mary A. Murray had also asked Judge James R. Brandlin in court papers to set a probation revocation hearing because Brown was arrested last October in Washington, where he faces a subsequent misdemeanor assault charge. He was accused of hitting a man trying to take a picture of him outside the W Hotel. Murray noted in December that prosecutors could not proceed with a hearing on a probation violation because she did not have the witnesses’ names. She said they now have the names and have “sufficient evidence” for a probation violation hearing related to the arrest. But Brandlin said he would not jail the singer because he has shown progress in rehab. Brown’s next court hearing in Los Angeles is scheduled for Feb. 28.